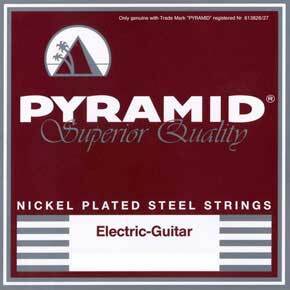 PYRAMIDNickelplated Steelsare made of a special alloy. The steel wire is refined with a thin layer of pure nickel. This pure nickel surface gives a pleasant feeling of playing, and the steel ensures an excellent magnetic tone pick-up. This combination makes these strings super brilliant, heavy-duty and long-lasting, with a perfect sustain and full sound. Just ideal for sound-conscious guitarrists of Rock and Heavy Metal.